An engaged employee knows how their job impacts a client, has a desire to help their employer improve and is proud to tell people where they work. But how do you get to that point? According to Gallup, over 69% of employees are currently not engaged in their work. This can make or break a company, as engaged workgroups are 62% less likely to be involved in on-the-job accidents and contribute to 2.6x higher growth rates. 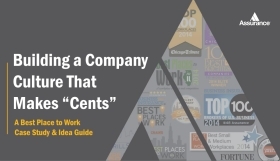 Download our Best Place to Work (BPTW) Guide to understand the financial impact of an effective workplace culture and get over 30 engagement ideas.